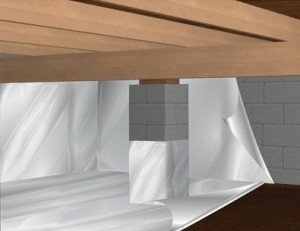 If your Northern Virginia home is built on a crawl space, you may not be aware that most crawl spaces are susceptible to moisture problems. Water enters a crawl space from a variety of sources including heavy rain, groundwater, and plumbing leaks. The soil beneath your crawl space soaks up water from above and below. After a rain, the soil soaks up the water which then moves up to the soil’s surface and enters your crawl space through cracks in the foundation. When your crawl space has moisture and then evaporates, creating humidity, this humidity gets into your home’s living area creating higher electric bills, wood rot, mold, and mildew. A wet crawl space is also a place where insects and rodents are likely to enter. If a wet or damp crawl space is not identified and not taken care of, it will damage the structural integrity of your home when the wood rots from the moisture. Once this happens, your foundation will start to shift, causing foundation failure. Don’t let a damp or wet crawl space cause you or your home to become unhealthy or compromise the structure of your home. Let the professionals at Reliable Waterproofing & Masonry inspect your crawl space and find the solution to your wet or damp crawl space repair needs. Reliable Waterproofing & Masonry offers crawl space encapsulation using a vapor barrier manufactured by Earth Contact Products (ECP), the leader in waterproofing and foundation repair products in the industry. This vapor barrier lines your crawl space and provides a clean storage environment while reducing energy costs and protecting it against moisture, mold, radon and unwanted pests. This vapor barrier is 10-mil to 16-mil thick and is puncture resistant. It is manufactured using a triple-ply woven high-density polyethylene membrane and has the highest strength to weight ratio and highest tensile strength and tear resistance of any product on the market. The vapor retarder that you can buy at your local hardware store are 6-mil thick and are not puncture resistant. Once even a small hole gets in the material, it will completely lose its effectiveness. Don’t compromise when it comes to your waterproofing or foundation repair needs. Your home is a big investment and keeping it safe will save you money in the long run. Let the professionals at Reliable Waterproofing & Masonry protect your Northern Virginia home, with our repair services. We can offer foundation repair, waterproofing, and masonry services in the Northern Virginia area including the cities of Richmond, Hanover, and Petersburg. Reliable Waterproofing & Masonry has over 30 years of experience in the Northern Virginia area. We have the products and experience to get your foundation repair, waterproofing or masonry repair needs to be done. Don’t hesitate, contact us today!